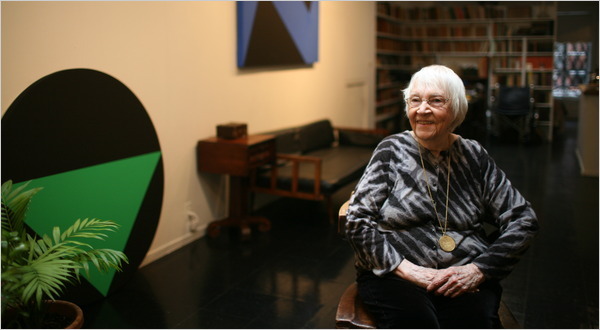 Article about 6 artists who made it big after turning 70 including Carmen Herrera who sold her first painting in 2004 at the ripe age of 89. Lisson Gallery Milan presents an exhibition of new works on paper by Carmen Herrera. Herrera produced a number of paintings on paper throughout the 1960s, but subsequently focused on canvas until revisiting the medium in 2010. This new body of work showcases not only her revised treatment of the medium but also a new dimension to her work. There will be a catalogue of 42 works to accompany this exhibition with an essay written by Estrellita B. Brodsky. Cuban artist Carmen Herrera, pioneer of geometric abstraction and Latin American Modernism, will present her works (the most comprehensive exhibition in Europe) at the Lisson Gallery. Is Carmen Herrera influencing fashion? Perusing fashion’s omnipresent color-blocking—a trend that surfaced in the fall/winter collections and which has only strengthened in the resort pieces now in stores and spring clothes due to arrive any minute—one can’t help but notice an effortless association between these architecturally inspired looks and a certain South Beach neighborhood. From bold color combi-nations to design treatments that are often decidedly linear in their graphics (what leaps to mind is the “engineered plaids” crafted by the always architecturally minded Narciso Rodriguez, who for resort was inspired by Cuban-American artist Carmen Herrera), do designers have the Art Deco District on their minds? A number of technologies make it possible for an artist to produce multiple versions of an original design. Selected from the MIT List Visual Arts Center’s Permanent and Student Loan Art Collections, works in this exhibition highlight a range of image transfer techniques and consider how an artist’s choice of reproduction technology can operate in relation to the image reproduced. Screenprinting is the image transfer technology used by a number of the artists in the exhibition, a process wherein a fine mesh-like screen is stretched across a frame, itself hinged to a baseboard, and a stencil is attached to the screen. A support such as paper is placed below the screen and a squeegee is used to push ink across the screen and to areas on the support not masked by the stencil. The empty intersections delineating Carmen Herrera’s works from 2009 makes plain the presence of the stencil in their construction; the prints do not represent themselves so much as establish connections with surrounding space and the process whereby they came into being. Mel Bochner’s Untitled, 1984, investigates the relationship of thinking, seeing, and drawing and how this can be held in tension with the mechanical repeatability of the screenprinting process. What appears to be erasing in the work is actually masking by the stencil, while the drips and irregularities makes evident the dimension of time—both human and technological—in the process of the work’s creation. We are pleased to announce the Sotheby’s Latin American Auction to take place on May 25 and 26. Jose Bedia, Enrique Martinez Celaya, Julio Larraz, Agustin Fernandez, Carmen Herrera, Emilio Sanchez, Tomas Sanchez, Carlos Alfonzo, and others. Click Read more for more information including viewing times. Arratia, Beer Gallery in Berlin is very pleased to present the work of the Cuban artist Carmen Herrera. Born in 1915 in Havana, Carmen Herrera has worked consistently since the late 1930’s. After studying at the School of Architecture of Havana, Herrera lived in Paris during the postwar years joining the vanguards circles of geometric abstraction and taking part in the exhibitions of the Salon des Nouvelles Réalités, along with Josef Albers, Jean Arp and Sonia Delaunay. In 1954 Herrera established herself in New York. Under a skylight in her tin-ceilinged loft near Union Square in Manhattan, the abstract painter Carmen Herrera, 94, nursed a flute of Champagne last week, sitting regally in the wheelchair she resents. Carmen Herrera: Is it a dream? After a lifetime of anonymity, the 95-year-old Carmen Herrera is suddenly one of the world’s most collectible living artists.